Thoracic surgeon and robotics innovator Dr. Farid Gharagozloo believes regular early screenings and better follow-up care will significantly reduce the annual number of Americans dying of lung cancer by almost two-thirds. Gharagozloo, director of cardiothoracic surgery at Florida Hospital Celebration Health, says the medical establishment in the U.S. and patients themselves share the blame for the unreasonably high number of lung cancer deaths today. Patients need to be more assertive. Doctors need to be more aggressive. Together, they can make a big difference. The American Lung Association estimates that 158,000 Americans will die in 2015 from lung cancer, which is 27 percent of all cancer deaths and more than breast, colon and prostate cancers combined. November is Lung Cancer Awareness Month. Although smoking or exposure to secondhand smoke is responsible for an estimated 85 percent of all lung cancer cases, an exposure to toxic asbestos greatly increases the risk. Dr. Farid Gharagozloo shares his thoughts about robotic thoracic surgery. Gharagozloo believes the key to reducing lung cancer deaths is an aggressive promotion of readily available CT (computed tomography) screenings, which are the most reliable road to early detection. Gharagozloo believes anyone 55 and older who smokes daily, or smoked daily and quit in the last 15 years, should undergo an annual CT scan, even if symptoms are negligible. Gharagozloo believes there is a glaring need for more discussion and more attention paid to lung cancer, much like there has been for breast cancer and prostate cancer. The death rate for those cancers dropped significantly in the past 20 years, primarily because of early detection. An estimated 221,000 new cases of lung cancer are expected to be diagnosed in 2015, according to the American Lung Association. Unfortunately, only 15 percent of those are detected when it still is localized and when the five-year survival rate is almost 60 percent. The five-year survival is only 4 percent for a patient diagnosed stage III or IV, after the cancer already has spread to other organs. 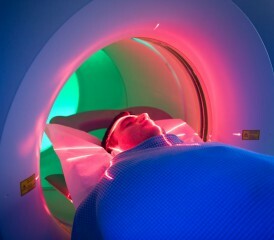 A typical CT scan costs an estimated $300 for someone without insurance. Medicare usually will cover the cost, and private insurance companies either cover it now or will begin covering it in 2016. Gharagozloo believes the second step toward saving thousands of lives is improved, post-scan follow-up care. Too often, a small nodule will show up in a scan, and a doctor will wait for another scan in 6-12 months before deciding what to do. Or a medical professional without experience in lung cancer will read it and not fully understand the scan. Although small, abnormal areas, often called nodules, that show up on a CT scan may not be cancer, they should lead a patient to an experienced pulmonologist. The next step may be a navigational bronchoscopy, which can better identify the potential presence of early-stage lung cancer. The advent of minimally invasive, robotic surgery, which Gharagozloo has helped pioneer, now allows surgeons to handle early-stage lung cancer without major chest-opening procedures. It often will convince a patient to attack the cancer early, when it is most curable, instead of taking the ‘wait and see’ approach that often leads to metastasis and a poorer long-term outcome. Gharagozloo came to Florida Hospital in early 2015, helping mesh its Global Robotics Institute into a more comprehensive lung cancer program. Previously, at the University of Arizona Health Network, he was the first to use robotics to perform an extrapleural pneumonectomy for a mesothelioma patient. That’s something he also is doing at Florida Hospital. Yet lung cancer is where he will have the biggest impact. Although smoking has declined significantly in recent years, lung cancer deaths have not. They have risen by 4 percent in the last 15 years. And that is unacceptable to Gharagozloo. The overall five-year lung cancer survival rate is 17.8 percent compared to 90.5 percent for breast cancer and 65.4 percent for colon cancer. American Lung Association. (2016, November 3). Lung Cancer Fact Sheet.